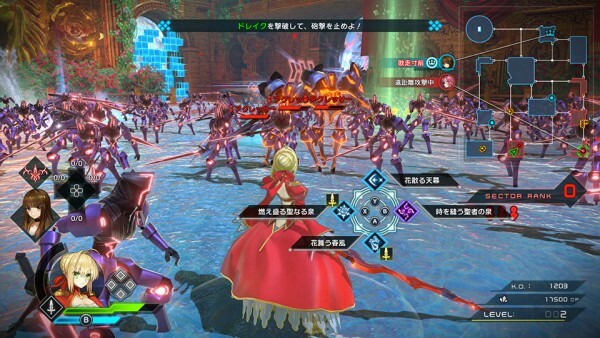 More new footage and screenshots. 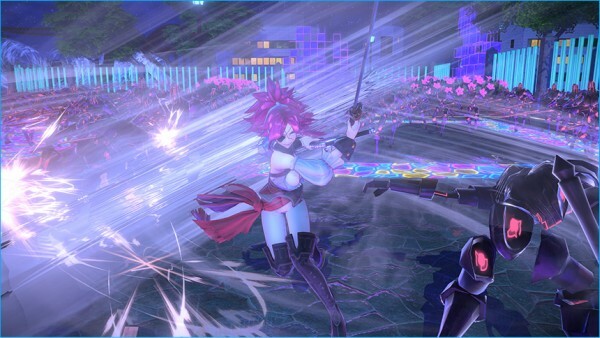 Marvelous has released three more short gameplay videos of Fate/Extella Link featuring playable Servants Tamamo no Mae, Elizabeth Bathory, and Li Shuwen, as well as information and screenshots on the game’s new action system. 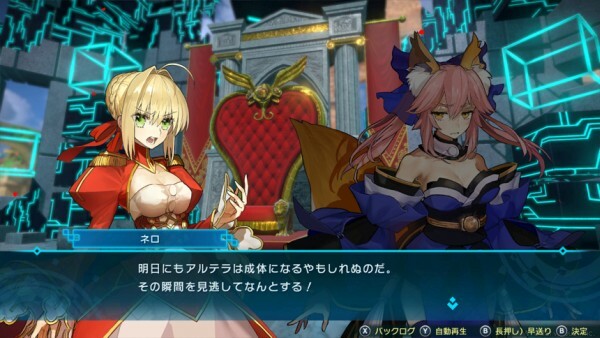 —Nero and Tamamo no Mae, who fought in the previous game. This time, they seem to be fighting while still having a friendly relationship. —Charlemagne’s pure language seems to have even unexpectedly satsified Her Majesty the Empress. 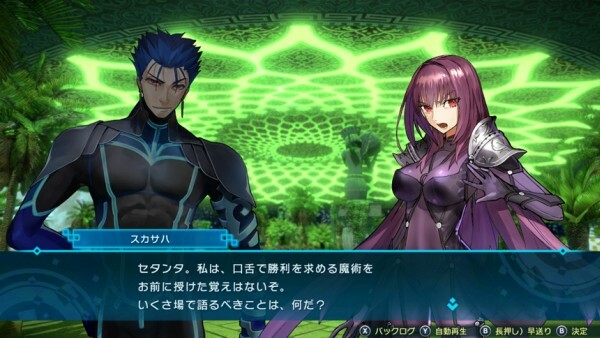 —Drake was the first Servant players fought in Fate/Extra. It seems she will once again stand in your way as an enemy. What are her true intentions? 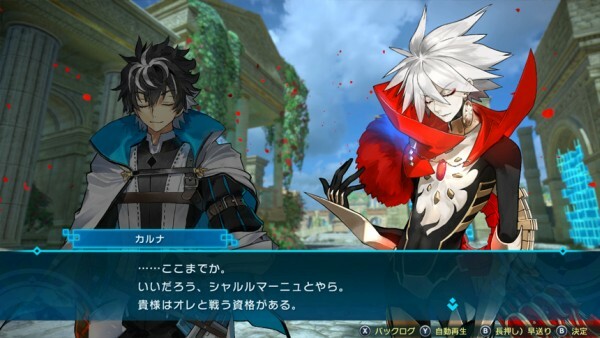 —Karna, who was supposed to be a vassal of Tamamo no Mae, invades Rome! Why does he call himself the “Hero of Charity”? —Astolfo was once one of the Twelve Paladins that served Charlemagne. Does Charlemagne have a great deal of trust in him…? —Scathach and Cu Chulainn have a student-teacher relationship. It seems that they are confronting each other, but what exactly happened? —In the Moon World, the population is gradually increasing, including immigration from earth and the like in addition to AI. 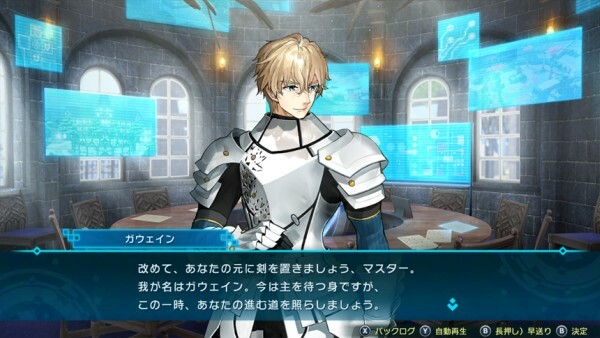 Will the day come that Gawain finally meets the Master he has been waiting for? 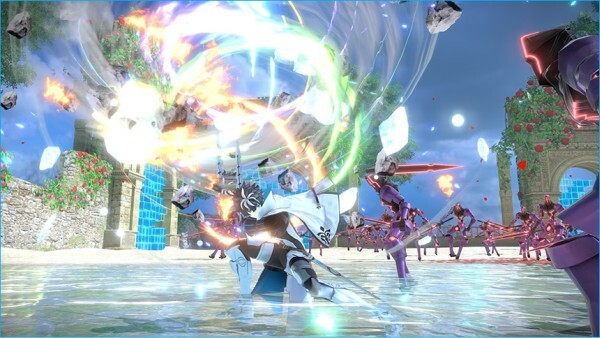 “Active Skill” is a new action that lets you use powerful attacks and ability strengthening. 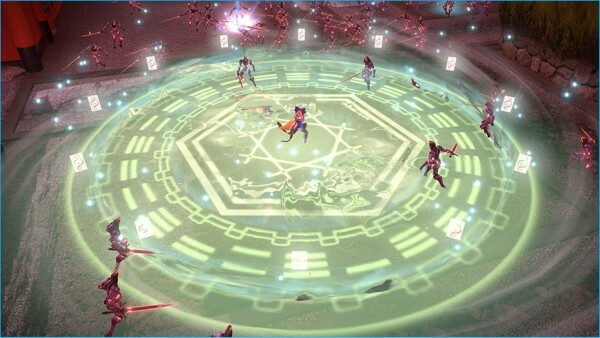 Set Active Skills in the skill slots ahead of time to trigger them at any time during battle. However, once an Active Skill has been activated, it will take some time to activat it again. Active Skills are acquired as Servants level up. 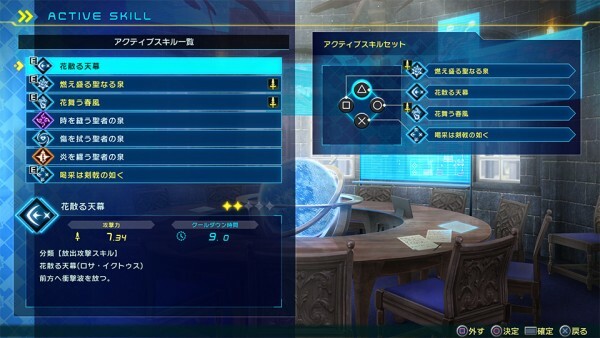 A maximum of four Active Skills can be set. 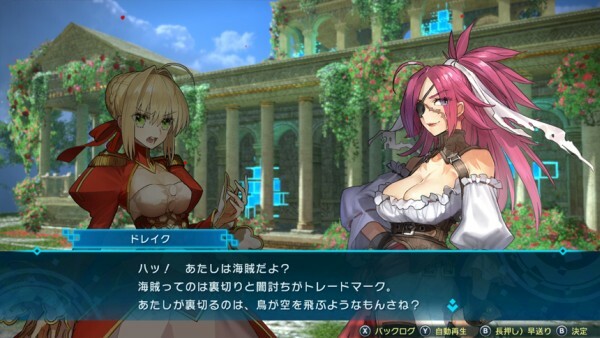 In addition to various effects such as attacking and recovery, there are also class specializations. 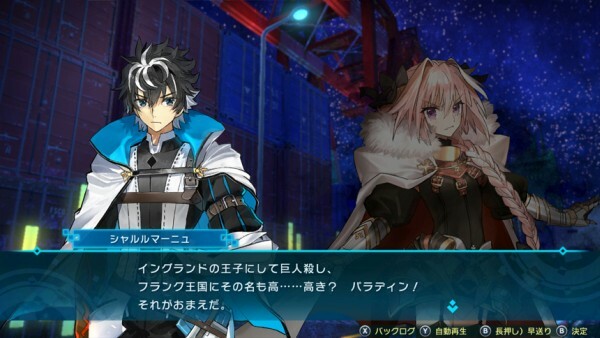 For example, Sabers specialize in close-range attack skills. —Strengthen Skill: “Pseudo Hero Sycophancy” – Summons the “Radiant Swords,” incarnations of the Twelve Paladins, to the back for a fixed period of time. The Radiant Swords will automatically attack in combination with standard attacks. 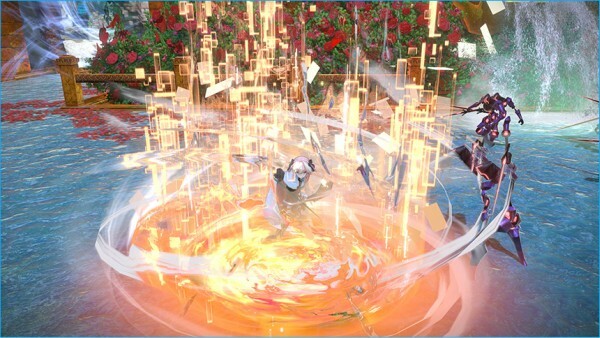 —Close-Range Attack Skill: “Lumiere Du Soleil” – Collects and condenses the power of the five major elements to “Joyeuse” and unleashes a full-power mow-down attack. 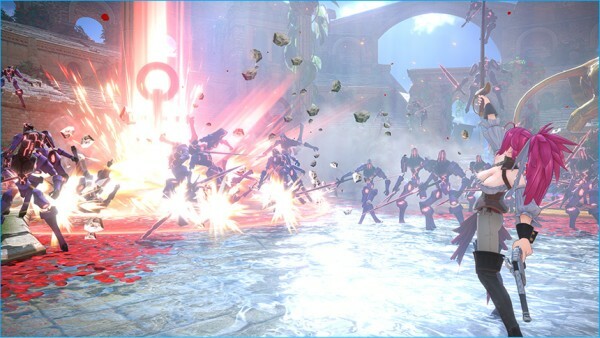 —Crowd Control Skill: “Trap of Argalia” – Mows down enemies with a “Golden Lance.” It turns the legs of the enemies it hits incorporeal and stuns them. 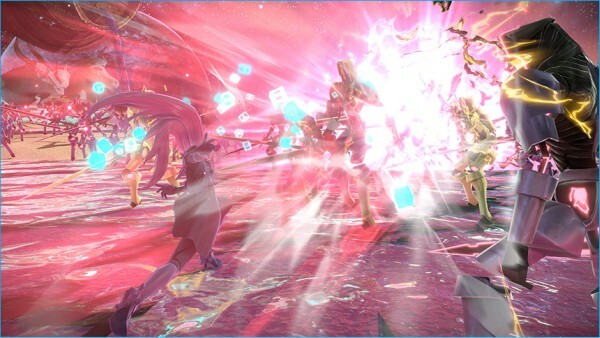 —Counter Skill: “Luna Break Manual” – An attack that wraps pieces of the “Luna Break Manual” around the user for a fixed period of time. While it is active, it negates incoming attacks while unleashing powerful counter attacks. —Vicinity Attack Skill: “Golden Anchor” – Summons three anchors from the sky that drop down on enemies. —Close-Range Attack Skill: “Dance Macabre” – A wild dance attack that slashes enemies with a Cutlass while moving forward. 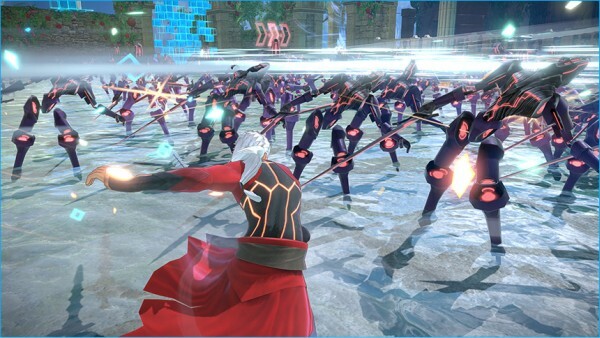 —Crowd Control Skill: “Sewing Thorns of Divine Death” – Throws the user’s spear forward, which splits and extends. It sews the enemies it hits to space and stuns them. 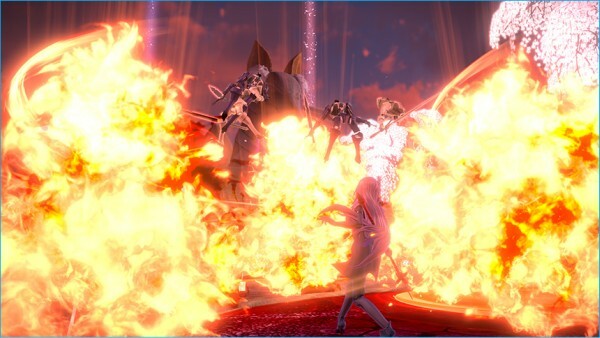 —Vicinity Attack Skill: “Ultimate Rune: Fire” – Uses the Ultimate Rune to generate three pillars of fire in front of the user. 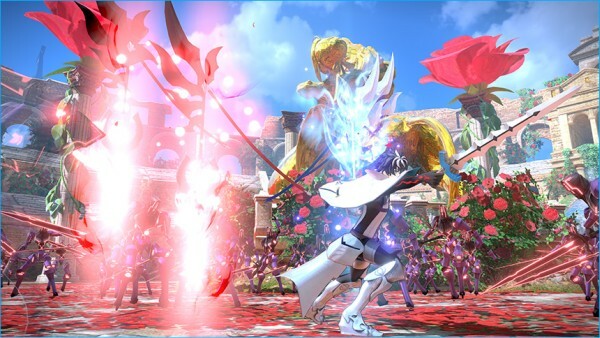 —Close-Range Attack Skill: “Fevens Ardeo” – The user leaps from the spot where it is activated and strikes the ground with a sword to cause an explosion. —Recovery Skill: “Sunshower” – Generates a recovery field with the user at the center. The HP of allies in the field will gradually recover. 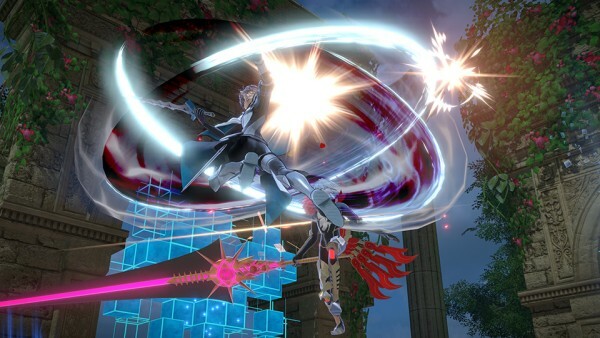 —Close-Range Attack Skill: “Extra Link” – A powerful, three-strike attack that projects and switches between the three swords “Durandal,” “Joyeuse,” and “Ultimate Flame” one after the other. 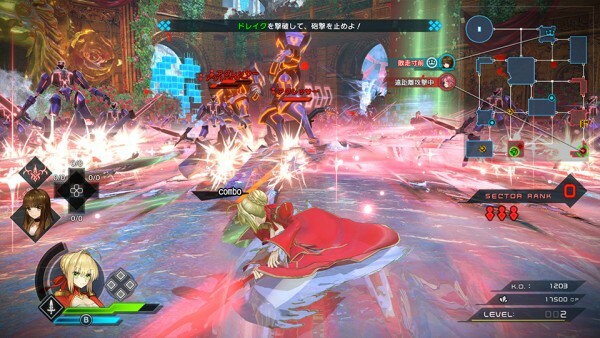 You can weaken enemy Servants by hitting them with consecutive attacks and Active Skills. 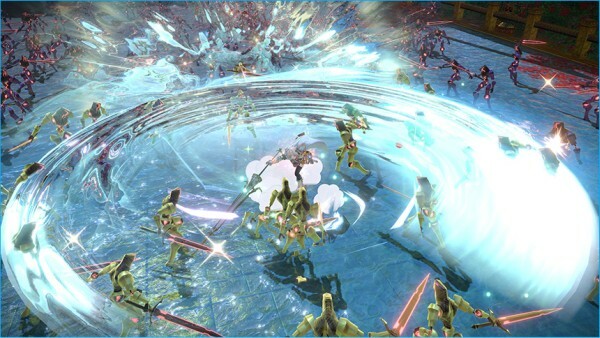 When they are in that state, use the Active Skills that the class of the player-controlled character specializes in on the opponent to activate a “Rush”! 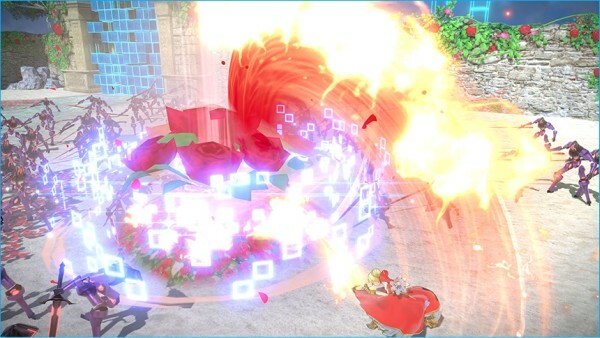 Not only can you hit the enemy with major damage through consecutive attacks, either one of the two power-up items “Attack Power-Up Item” or “Attack Speed-Up Item” will definitely drop, allowing you to continue the battle with an advantage. 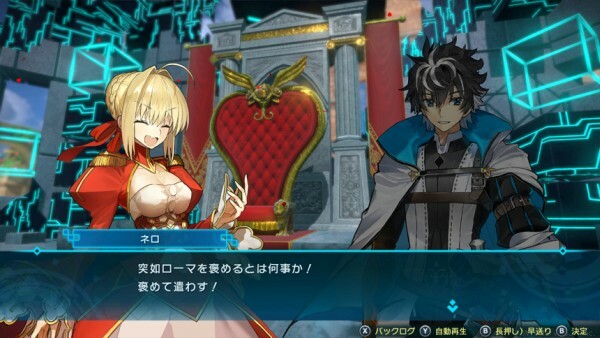 Fate/Extella Link is due out for PlayStation 4 and PS Vita in Japan on June 7.